It has been about a year since past 2014 CQ WW SSB Contest, when all gears required for contesting were setup in ORARI Lokal Bekasi (Indonesia Amateur Radio Organization – District of Bekasi) Office. Since then, none of YE1ZAT Contest activities were operated from this office. Significant local noise encountered was considered to be main contributing factor, why this should become primary concern by team member. Further, after having series of discussion involving YE1ZAT’s former team member, one of senior team member Joz, YD1JZ allowed his personal property to be utilized for next YE1ZAT activities with primary concern for DX-ing and of course contest. Proposed new station described herein is located in a location with more than adequate space for practice as well as getting rid off man made noise. This would certainly be good news considering continuation of YE1ZAT activities as well as providing facilities for new hams in shaping their learning curve. Once all resources were completely managed and organized, led by Danu, YF1DO as present YE1ZAT Team Leader, required materials were mobilized from workshop owned by Muri, YC1MR to this new station location that well known as GA (basically taken from previous business unit name Grin Area, that was based at this facility) . 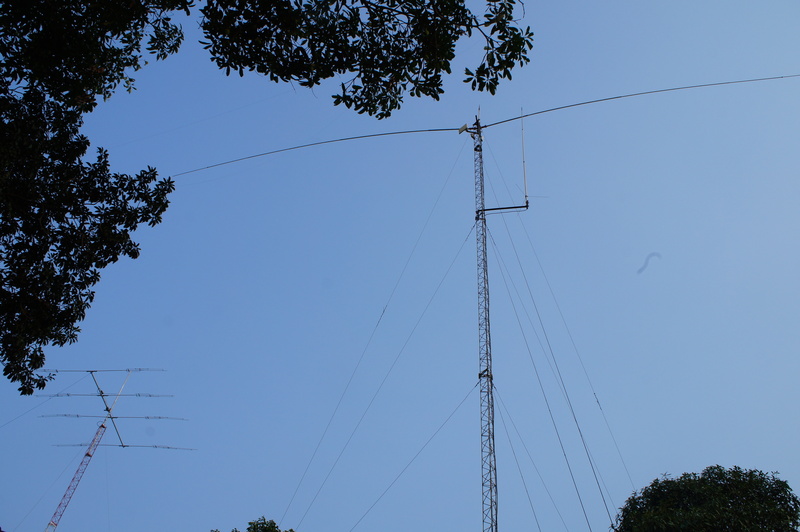 After spending several hours in constructing and erecting new antenna, this new station was completely setup eventually on Friday, September 18th, 2015 comprises 2 antennas ( dipole on 40m band and 4 elements tribanders 10-15-20 m bands). Nothing so fancy on this newly hooked up antennas though, moreover, these were composed from already available materials in Muri, YC1MR’s workshop. Meanwhile, to bear at certain direction, both antennas are still relying on manual rotation by means of a tag line attached onto boom tip. However, man behind the gun would be the key and plays role under any circumstances, and hopefully with this newly built contest station, practice and skill enhancement mainly to those related with amateur radio activities especially for YE1ZAT Team Member may be started and sustained. Resulted test performance conducted afterward, had proven that noise was greatly reduced compared against the one being setup in the former station. This performance test result was certainly a leading indicator for expected better outcome in upcoming DX Contest. Furthermore, it must be noted, that contest is not the only activity accommodated by YE1ZAT. Club station’s activity is not limited only to contest, but also all aspects outlining skill enhancement of Bekasi Amateur Radio, and this station would certainly further facilitate the needs. Finally, the real test in contesting was about to come. 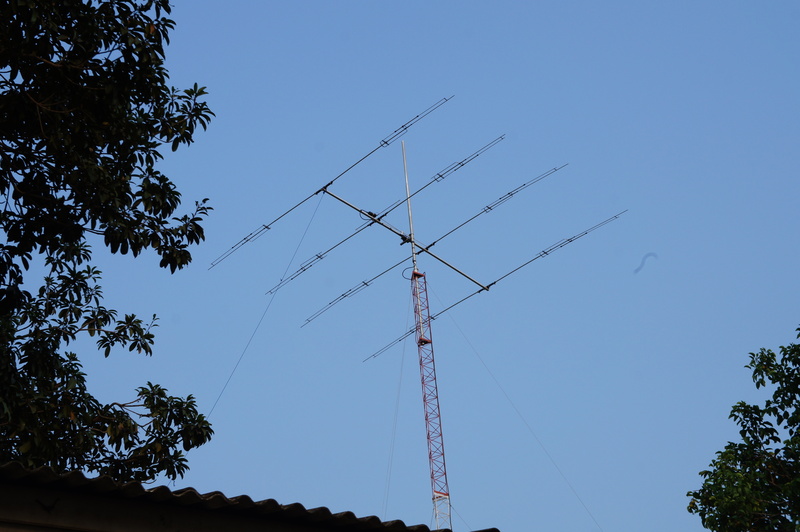 A week after things being accomplished including minor adjustment, team had a chance to participate 2015 CQWW RTTY Contest under Multi Operator – Low Power Category ( September, 26 – 27, 2015 ). While contesting activity kept moving on, other team member also took this opportunity in having digital operation knowledge share from present YE1ZAT “skipper” OM Danu, YF1DO. He took this opportunity to share his experience in digital operation to YE1ZAT Team Member, not limited to operating skill, but also how to properly setup software and hardware in digital. Even during sharing session, a ham fellow from Lokal Karawang (other district) Hadi, YD1DTE had this rare opportunity and taking part in this session. Above picture shows how sharing session took place during contest. (from left to right : YD1DGZ, YF1DO-pointing his finger on screen, YC1DPM, and ham fellow from Karawang YD1DTE). This session demonstrated one of Amateur’s Code is “FRIENDLY” : He operates slowly and patiently when requested; offers friendly advice and counsel to the beginner; kind assistance, cooperation and consideration for the interests of others. These are the marks of amateur spirit. At the end of contest, YE1ZAT achieved promising result in this category by having total claimed score 1,026,564. Good station and location, as well as outstanding result obtained during first contest participation in newly reinstated facility will certainly be nothing unless team member’s spirit and enthusiasm are sustained. The new challenge has just begun, indeed. This entry was posted on October 17, 2015 at 3:47 pm and is filed under Uncategorized. You can follow any responses to this entry through the RSS 2.0 feed. You can leave a response, or trackback from your own site.